DJ Octavio is the leader of the Octarians and the final boss of both Splatoon and Splatoon 2's single-player modes. In the latter, he appears alongside Callie, and is trapped in a snow globe-like tank near Cap'n Cuttlefish or Marie after being defeated for the first time. Unlike most Octarians, which appear to be severed tentacles of octopuses, DJ Octavio is an octopus in his entirety. He is a dull red-violet with darker areas around his eyes and tentacles and appears to be perpetually angry. He wears a large gold helmet in the style of kabuto with an octopus-shaped emblem on the front, and one of the two tentacles that are always crossed in from of him bears a large, green, X-shaped scar identical to the ones seen on other bosses. He sits inside of a flying machine equipped with a pool of purple ink and a turntable, which he plays using plentiful stalks of wasabi. The turntable also has four cannons on the front, two extendable fists and a set of thrusters allowing it to fly. Surrounding the machine is a large, magenta-colored force field, which neither Agent 3 nor their ink can pass through. It is only visible when close to the machine, as a warning to the player that they need to push it back to a comfortable distance. During the first part of Enter the Octobot King, he fights the player normally, but when the Squid Sisters' song starts to play he abandons his turntable to dance around. At several points in the song, he strikes a series of poses and laughs, which may go unnoticed due to the general mayhem of the battle. In the Japanese version of Splatoon, DJ Octavio speaks entirely in katakana, indicating an accent of some sort. Unlike Jelonzo, however, he uses correct grammar. In Splatoon 2, he once again the final boss, fought in the level Tide Goes Out. the DJ's flying machine has received an upgrade since the last game. It now has a second level, on which a brainwashed Callie stands and sings. Below her is the main control, in which the DJ sits. In front of the turntable and wasabi stalks is a tray of calamari bombs, which go flying (Aesthetically) as the player attacks the DJ. On the back of the machine are some exhaust pipes, which Octavio uses for the dash punch attack. The two giant fists are now gold and sparkly and have brass knuckles on them, which reads something in the Octarian language. There are 4 holes on the front of the machine, in which bombs and the ink shower attack are deployed from. There are plenty of speakers on the machine, and a plethora of lights as well. The DJ's appearance has also changed: His kabuto helmet is now black with golden accents, and he wears a pair of shutter shades. This boss fight uses everything the player has learned throughout the missions in Octo Valley. During the boss fight, DJ Octavio uses several moves to attack the player. Octorpedoes that shoot out from four cannons on the front. They home in on the player, but can easily be evaded or destroyed. They spread a small amount of ink if they land. Two giant fists that can be extended to try and punch the player. If shot at before they hit the ground, they will fly back into the machine and damage it, pushing it backwards. Small projectiles that resemble disco balls. If they hit the ground, they will spawn an enemy. If they are shot before then, they will harmlessly explode in midair and nothing will spawn. The type of spawned enemies depends on which phase of the fight the player is on, with Octocopters and Octobombers initially, Octoballs in the second phase, and Twintacle Octotroopers in the final phase. Killer Wail. Unlike the Inklings' Special Weapon of the same name, this variation is smaller and takes longer to charge up. A massive, octopus-shaped bomb that explodes into a huge amount of enemy ink if it lands. If it is shot back at DJ Octavio, he will punch it back at the player twice - he then runs out of fists and will be hit by it. These bombs are necessary for damaging him greatly and defeating him. Two giant fists, now with brass knuckles, that the player can either hit if they light up pink, or have to dodge if they are spinning. Bombs, such as splat bombs and suction bombs. Small projectiles resembling a fried ball of takoyaki, which Marie refers to as "Calamari Bomb Things". They can be shot in the air or on the ground, but if the player waits too long, they will explode into a stationary tornado with bits of octopus inside. A shower attack, in which DJ Octavio will pour ink out of the 4 holes in his flying machine and charge towards the player. During the 2nd phase, the DJ will raise up into the air, making his punches a little harder to hit. During the 3rd phase, the DJ will perform a dash before a punch, making it a little harder to hit the fists. During the 4th and final phase, the DJ will raise his flying machine into the air permanently, forcing the player to follow him via launchpad. The player then has to use the Rainmaker to hit his pink non-spinning punches, or jump over the spinning punches, all whilst on a Ride Rail. Younger Cap'n Cuttlefish and DJ Octavio (both in respective humanoid forms) having diplomatic relations. Shown at the right is Sunken Scroll 16. It shows him with Cap'n Cuttlefish. DJ Octavio is one of few Octarians that have dialogue that can be heard by the player, another example being Marina. While Octolings make Inkling-like sounds, what they are saying remains unknown, though sanitized version did have them say a few lines. The weak point of all Great Octoweapons in Octo Valley, the tentacle, is identical to DJ Octavio's scarred tentacle, implying that he is operating each one. DJ Octavio's English dialogue differs drastically between the North American and Europe/Oceania versions of Splatoon, as shown below in the gallery. In Splatoon, if the player fights DJ Octavio again after defeating him before, the dialogue changes; it describes a scenario in which he has escaped from his snow globe and recaptured Cap'n Cuttlefish. In Splatoon 2, if the player fights DJ Octavio again after defeating him before, the dialogue changes again; now it describes a scenario in which he escaped from his snow globe, and Callie put on the hypnoshades again because they 'looked fresh' on her. Though he cannot be interacted with while in the snow globe, he will cower and glow purple if shot at. When designing DJ Octavio, the development team of Splatoon first decided on the name "Takowasa" (DJ Octavio's Japanese name). He was then changed from a wasabi maker to a DJ, followed by scratching music being brought in. The music starts with a rhythm that goes like 'don don don don', at which it was decided to match the rhythm with DJ Octavio's wasabi making. DJ Octavio is claimed to be the inventor of the music genre "Octaronica". DJ Octavio's kabuto helmet is similar to that of a samurai's, indicating he may be royalty. Despite Cap'n Cuttlefish's revelation that Inklings dry out and lose ink as they age, DJ Octavio doesn't appear to have dried out, despite being in the same age range. How he achieved this is unknown. 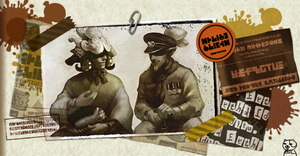 In an old picture depicting Cap'n Cuttlefish in combat with DJ Octavio (found by Pearl and sent to Marina's chat room), DJ Octavio has the same teeth as the playable Octolings, which differ from those of Inklings. DJ's Octavio's name may be referring to the Spanish word Octavo which means eighth, referring to the fact that Octavio has eight tentacles. DJ Octavio in the Octobot King. DJ Octavio in the Octobot King MK II. The force field around DJ Octavio's machine. DJ Octavio dancing to the Squid Sisters' song when they override his own. The first set of poses included with the dance. At the end of the mission, his helmet clips through the platform. DJ Octavio's reaction to Agent 3 attacking his snow globe. A worn Ammo Knights label on the snow globe. DJ Octavio's dialogue box icon. DJ Octavio's dialogue box icon in Splatoon 2. DJ Octavio's return in Splatoon 2. DJ Octavio, after being defeated. A picture of DJ Octavio fighting Cap'n Cuttlefish shared in Marina's chat room. A mem cake of DJ Octavio from the Octo Expansion. DJ Octavio may be derived from octo and octave. ↑ Assumed from multiple pictures of Octavio in a humanoid form, and from him having a full octopus form, rather than just a tentacle. ↑ As noted in the Trivia section of the Off the Hook page, this is intentional and indicates that the character is speaking in a different in-game language. This page was last edited on 12 April 2019, at 16:16. This page has been accessed 160,520 times.